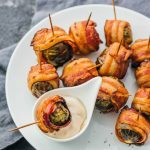 A favorite fall appetizer -- roasted brussels sprouts wrapped with crispy bacon slices, dipped in a balsamic vinegar and mayonnaise sauce. Prepare a baking tray lined with parchment paper or a baking mat. Wrap a bacon slice around each brussels sprout, and secure with a toothpick. Place in a single layer on the baking tray. Bake at 400 F until the bacon is crispy and the brussels sprouts are very tender, about 40 minutes. Combine mayonnaise and balsamic vinegar together in a small bowl. Stir until smooth. Serve the bacon wrapped brussels sprouts with the balsamic mayonnaise dip. This recipe yields 2.5 g net carbs per serving.